Click on a thumbnail image to view a larger 24-bit JPEG image. These look great on a monitor set to millions of colors; they may look funky and/or show color-banding at lower bit depths. These photographs were taken by Thomas E. Dietz, and all are copyright© protected; they may be downloaded for your personal viewing only, all other rights are reserved. Gorgeous large color prints are available for purchase. 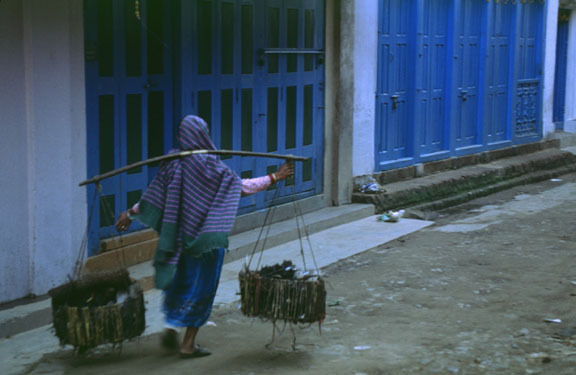 A woman walking through a blue scene, early morning in Kathmandu. 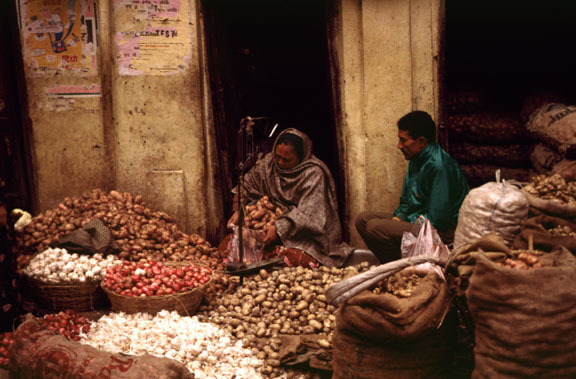 A couple selling potatoes, garlic, and onions in an early-morning street-market scene in Kathmandu. 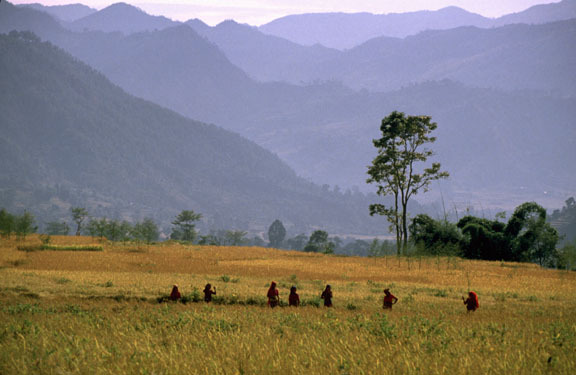 A line of women harvesting rice in the Annapurna region. 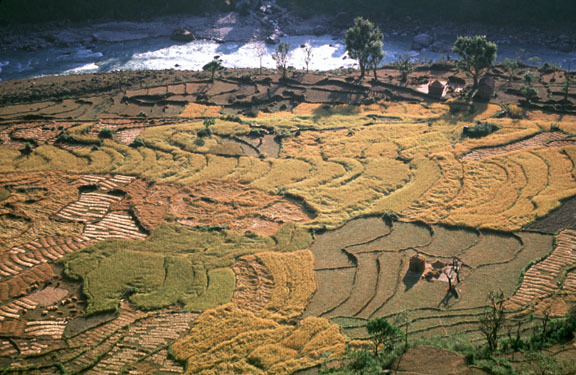 Fields of rice being harvested along the Marsyangdi River in the Annapurna region. 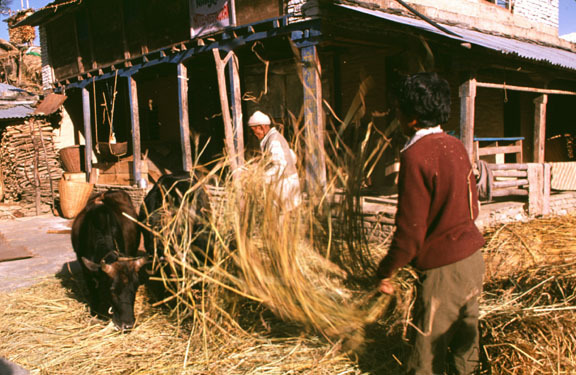 A family in the Annapurna region threshing their rice by having cattle walk over it. 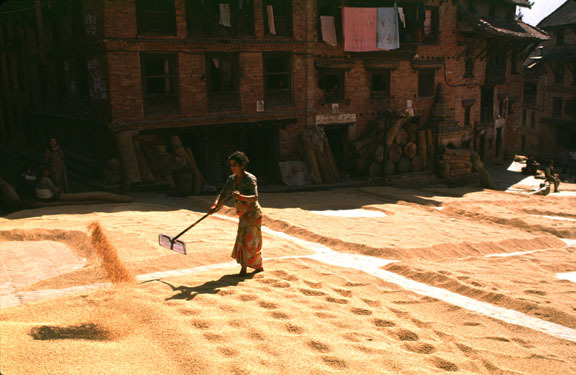 Many families' rice harvests lie drying in the sun on the streets of Bhaktapur, a town just outside Kathmandu. A Sherpa man who runs a teahouse (a sort of inn) on the Everest trek. We had spent the previous evening sitting in his kitchen drinking apple brandy and sharing stories. 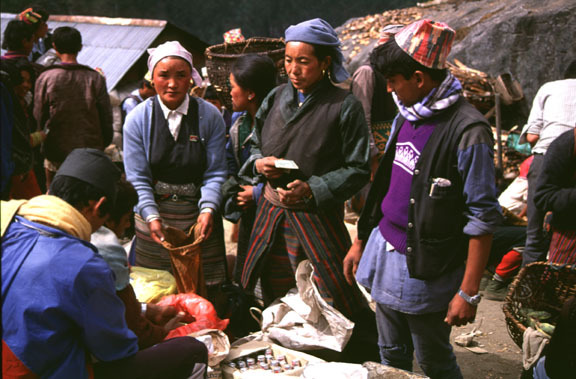 Two Sherpa women buying grain on market day in Namche Bazaar (3440 m, 11400 ft). 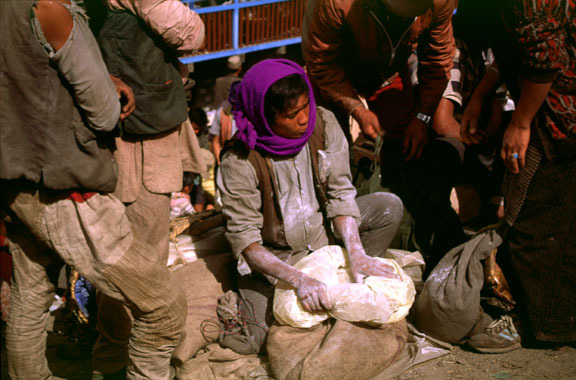 A lowlander selling tsampa flour on market day in Namche Bazaar (3440 m, 11400 ft). A chili pepper vendor on market day in Namche Bazaar (3440 m, 11400 ft). 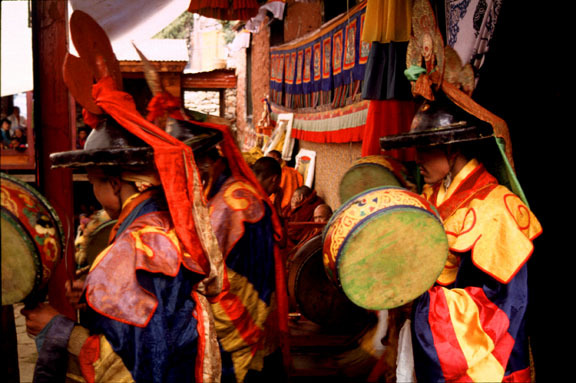 A line of costumed monks dancing at the annual Mani Rimdu festival in Thame (3800m, 12500 ft). This is a festival to the God of Compassion, and the dances are a retelling of the story of Buddhism being brought to Tibet.